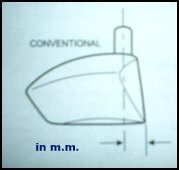 Driver Face Progression, Offset, and Sole Radius. What are they? DRIVER FACE PROGRESSION, HOSEL OFFSET AND SOLE RADIUS ? Driver face progression and hosel offset are minor club head design parameters that have some affect on the direction and trajectory of your drives, but along with your driver’s sole radius, it is good to understand what they are, and what they do. 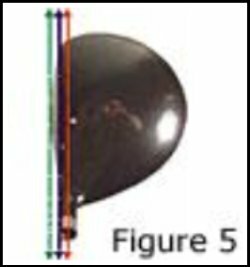 In figure 5 above, driver face progression is defined as the distance from the centerline (Red line) of the hosel bore or center line axis of the shaft, to the center of the leading edge (Green line) at the bottom of the face. Manufacturers of golf clubs do not provide driver face progression measurements as part of their specifications and maybe for good reason. It would only create confusion amongst consumers; however, with the advent of hybrids, the measurement may become a common specification some day to further describe these heads. Conventional driver face progression is measured in millimeters and usually ranges between 14 to 21 m.m. It actually has a bearing on two important and different aspects of shot performance. 2. The forward bending of the shaft coming into impact for possible trajectory change through the change in distance from the center line of the bore to the center of gravity in the head. During your back swing the face of your driver is actually some 90 degrees open and as you come down to the ball (your downswing) you are trying to return the face to square. Quite difficult for most of us amateurs. Because the club face is being rotated back from open to square on the downswing, if the face of the driver is actually behind the hosel, this gives the golfer a split-second more time to continue rotating the face back around from open to square. As a result, this is how driver face progression is able to exert some influence on the orientation of the face at impact, and from that, have an effect on the accuracy of the shot. Therefore, the less face progression measurement, the more help is given to the golfer. Which of course leads us to the hosel offset driver. As you can see in this image, an offset driver has very little face progression in m.m. 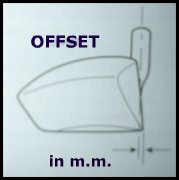 Hosel offset is defined as the distance from the forward wall edge of the hosel to the leading edge at the bottom of the face. Many club makers think only of Face Angle as a fitting specification for helping reduce a slice or fade with drivers. Face angle can be the most effective antidote for misdirection because it can be selected in ever increasing increments of degrees of the closed face angle. However, recommending driver heads for the golfer who slices the ball which is designed with an offset hosel can be another very effective way to reduce the golfer’s tendency to slice or fade the ball. In the case of the more severe slicer, a combination of a head with an offset hosel and a more closed face can act as a double whammy of improvement. Don’t rule out trying these offset heads, as you can usually see an immediate improvement. 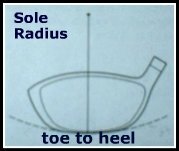 Sole radius is a single term that describes the amount of curvature on the sole of the driver head primarily in the direction from the heel to the toe side of the sole. While there is a slight face to back sole radius on most driver heads, it is very slight (almost flat but not quite) so the leading edge of the face is only slightly raised off the ground. The only function of the toe to heel sole radius on driver heads is to allow a relatively smaller area of the sole to glide over the turf so as to not cause the entire toe to heel width of the sole to drag or catch the turf. Since 99% of driver hits are off of a tee, sole radius does not have much effect on the shot. Only in the rare case of a golfer trying to hit the driver “off the deck” would the sole radius of the 1-wood have a bearing on the success of the shot. Where it comes into play the most in club head design is in your fairway woods, for obvious reasons, of hitting these woods off the ground.